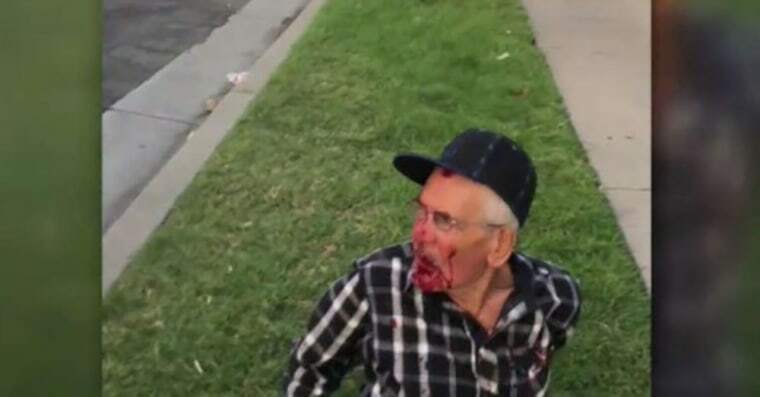 A 92-year-old man who was thrown to the ground, stomped on by strangers on the Fourth of July was recovering Tuesday in his Los Angeles-area home. “Who would do this to anybody?” the victim’s grandson, Erik Mendoza, told NBC Los Angeles. The Los Angeles County Sheriff’s Department launched an investigation following Wednesday night’s attack on the man, Rodolfo Rodriguez, a native of Mexico and legal U.S. resident, in the community of Willowbrook. Rodriguez had gone out alone for his daily walk, Mendoza said, about an hour and a half before he was going to watch the holiday fireworks with his family. While walking, Rodriguez may have bumped into a small girl, witness Misbel Borjas told NBC Los Angeles. She said she saw a woman with the girl push Rodriguez and beat him with a brick. Borjas had been driving by, she said, and wanted to stop, but the woman threatened to hit her car with the brick. Borjas instead called 911 and took a picture of the woman, which she shared with police and put on social media. Borjas said a group of men then came down the street, and the woman accused Rodriguez of trying to take the child. That’s when about three of them also began beating him, she added. Only later, when Rodriguez’s family began wondering why he hadn’t returned home, did they learn he suffered two broken ribs and a broken cheekbone. Rodriguez, now recovering from his bed at home, told NBC Los Angeles that he wants his attackers to be punished and to pay his hospital expenses. His wife, meanwhile, said Rodriguez did plan to go back to his native country this month — but it was to visit the gravesite of their son who had recently died.